When twelve-year-old Bab Sharkey finds a magical beard in the Egyptian desert, it attaches itself to his face, making him the Pharaoh and granting him strange powers. Bab also finds the friends he’s always needed: a pair of undead animals wrapped in bandages called Scaler the Fish Mummy and Prong the Ibis Mummy. But the previous owner of the Beard, the ancient and evil sorceress Unpharaoh, is determined to get it back. Can Bab and his new Animal Mummy friends banish the Unpharaoh back to the Afterworld? 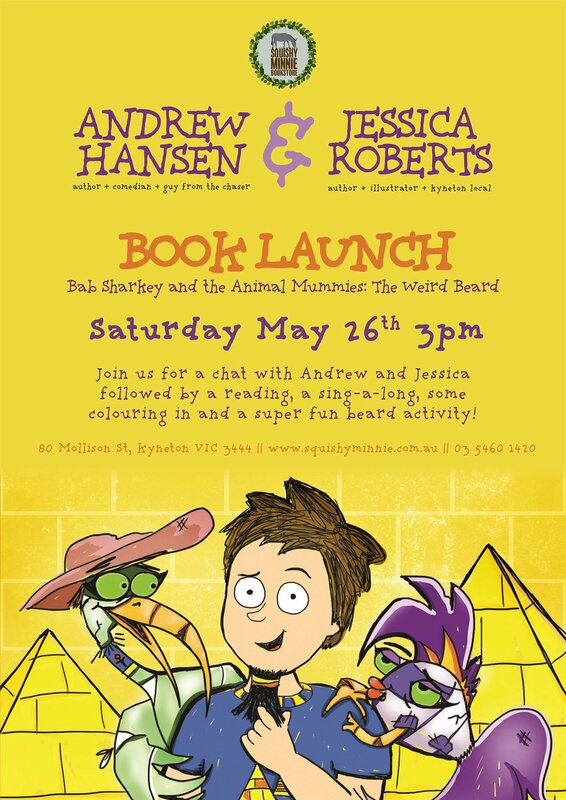 Award-winning Australian comedian Andrew Hansen, best known for The Chaser, has teamed up with his wife, designer Jessica Roberts, to create their very first children’s book series. This hilarious illustrated series is perfect for middle-grade readers with a wacky sense of humour. Join Andrew and Jessica at Squishy Minnie Bookstore on May 26th at 3pm to celebrate the launch of this exciting series and share in a fun activity filled afternoon! Posted in In Store Events and tagged book launch, comedian, event, funny, illustrator, in store, kynetonl, local.